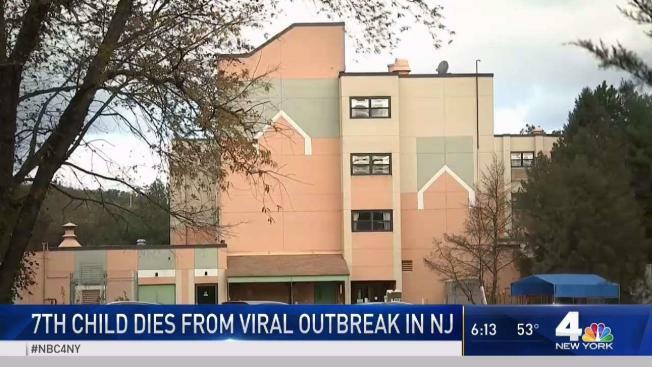 10th Child Dies at NJ Medical Facility After Viral Outbreak: Health Dept. A 10th child has died at a medical center hit by a viral outbreak, the New Jersey Department of Health said late Wednesday. Nine other "medically fragile" children at the Wanaque Center for Nursing and Rehabilitation in Passaic County died recently after being exposed to an adenovirus outbreak at the center. The department says 27 cases have been associated with the respiratory virus at the center. The affected children had severely compromised immune systems. One death was a young adult. A staff member at the facility, who has since recovered, also became ill as part of the outbreak. Preliminary tests have ruled out the strain linked to the 10 deaths at the Wanaque facility. The New Jersey Department of Health said additional laboratory tests confirmed the additional cases. The Wanaque Center established a 24/7 hotline for families impacted by the outbreak. Adenoviruses are common viruses that can cause a range of illnesses, according to the Centers for Disease Control and Prevention. The viruses cause cold-like symptoms, sore throat, bronchitis, pneumonia, diarrhea and pink eye. Adenoviruses can pose serious complications to certain people, particularly those with weakened immune systems, respiratory issues and cardiac disease. The state’s Department of Health said they were informed of the outbreak on Oct. 9. State health officials later found handwashing discrepancies.